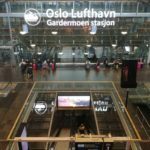 "you can do so so much better"
✅ Trip Verified | I travel through Oslo often. I find myself repeatedly disappointed by the lack of water fountains to fill drink bottles. If you are in the top half of the domestic terminal you are forced to buy expensive water from the kiosk. Very unsustainable! Aggressive security staff as usual. I wear an insulin pump and frequently come up against misunderstanding here. And of, the most frustrating thing of all- being transferred inland through arrivals, having to recheck baggage and reissue boarding passes (even though the computers won’t recognise a passenger that is already checked in and there is only one queue serviced by staff for check in). Oslo, you can do so so much better. Not Verified | Fine airport, but unimpressive ground crew on most airlines and very often delays. Not great selection of food, but it is a pretty small airport. Unorganized and chaotic lines everywhere. Wifi does not work well. 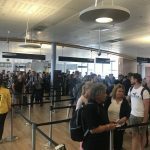 "only 2 counters were open"
Not Verified | I have been travelling by a plane for a very long time and this is the first time I am experiencing this. I was in the line for a Passport control for over 40 minutes. The line for EU passengers was empty, but they would not let us go through and the 10 passengers including myself have lost their flights. I had to pay for a new ticket which costed me 4 times more than the previous one, and there is nobody to turn to, everybody is saying that there is nothing they can do. Only 2 counters were open for a non EU Passengers, I have said 3 times that I will loose my flight,a nd my gangway was just next to the passport control. They have told me that I have time. ✅ Trip Verified | Eager security staff puts queueing times down by aggressive behavior. Staff pushed my trays so hard that the tray with my laptop toppled and crashed. When I tried to claim compensation for the broken screen avinor wrote to me it was my fault, because I did not use a tray. I am Silver with star plus delta and had a 750 flight legs before and yes I do put all my stuff into trays. Better do photos next time you fly through Gardermoen! 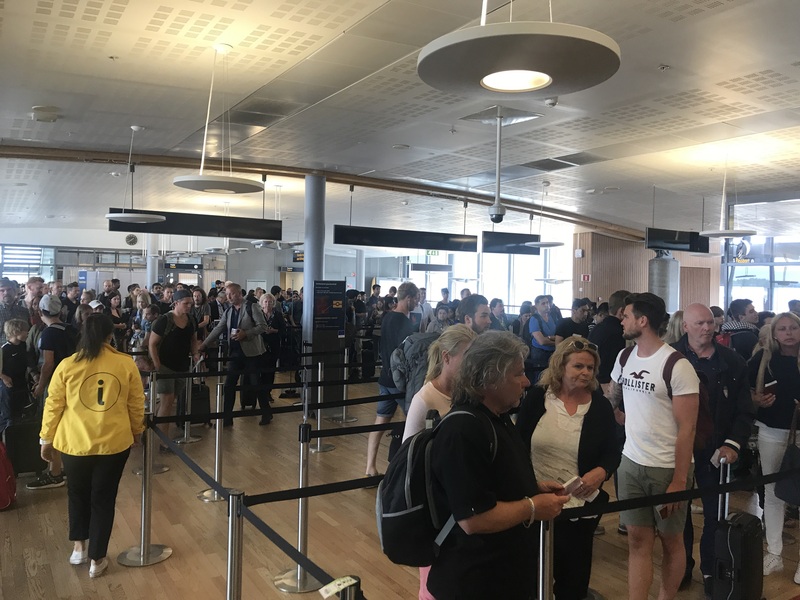 "the worst airport in Europe"
✅ Trip Verified | Information is bad, the airport does not have fast track, it takes ages to check in. The buisness check in and economy check in, does not have a system, passengers that fly buisness pay for something they don't get. Restaurants and staff are mad and really not nice. Probly the worst airport in Europe. Not Verified | Really clean and modern airport. Terminal seating isn't bad, but could be better. Queues don't take much time as they have many check-in desks. And for plane spotters, the terminal has windows so you can see both runways. 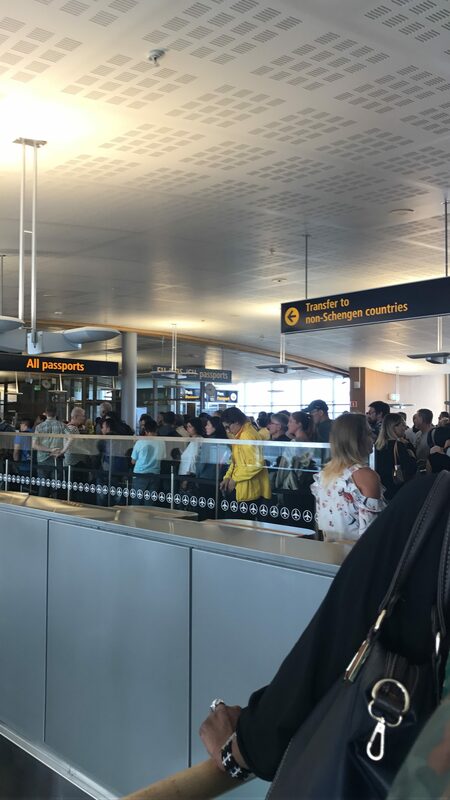 "it feels like a cruel joke"
✅ Trip Verified | I write this review from the ghost town that is Oslo Airport on a Monday afternoon. Granted, today is also New Years Eve. It’s 3pm on New Years Eve to be exact - not a public holiday in Norway, but apparently cause nonetheless for mass closures of all service industries, reduction of transport services to a skeleton timetable, and a seeming mass evacuation of staff. Let’s just take a moment to remember that Oslo Gardermoen Airport is an 'international' airport, there’s an Ethiopian Air plane parked on the tarmac for proof! Our flight from Trondheim was sardine-can full, there are flights heading from Oslo to diverse destinations like Fort Lauderdale, Istanbul, Paris, London, Addis Ababa, Doha yet seemingly, the good people of Norway have decided to take the week’s between Christmas and mid-January off, leaving travellers and tourists stranded, frustrated, hungry, and desperate for some booze to numb the pain of a tedious transit. Not only are the flights in this country exorbitantly expensive and service-free, it appears that weary transit travellers are entitled only to a sad and dried out chicken baguette of questionable freshness, and a lonely kiosk-worth of soft drink and chocolate. We head past closed bar after closed restaurant, hopefully, optimistically, towards TGIFridays (sadly, this is how low we’ve sunk), only to find it smugly closed. The lonely baguette/panini stand waving the flag for customer service does so conditionally - they can’t toast what’s meant to be toasted, they can’t heat what’s meant to be heated - it’s like a haunting gothic roundabout you can never get off that never goes round. I’m sure, when they’re here, the staff are Norwegian-efficient and reserved, the place is certainly clean, our flight arrived on time, this place may well do what it says on the box for much of the year, but right now, only a quarter of the way in to a despairing transit time, it feels like a cruel joke. Do not, I repeat, do not, come here, or in fact to Norway, over the Christmas/New Year period. 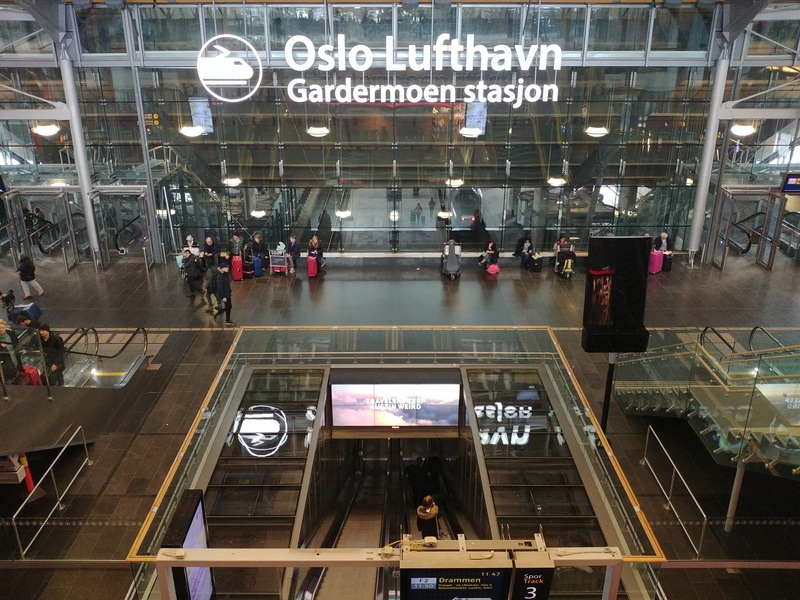 "were not at all apologetic"
✅ Trip Verified | I think Oslo airport is one of the cleanest, modern and most efficient airports I've ever been to, so I am sad to be writing this review. I am a very frequent traveller, however, this happened: First, I forgot to empty my water bottle. Also, I am used to Global Entry/TSA pre check (US version of Fast Track), so I forgot to take my laptop out of my bag as I sent it through security. My bag got pulled to the side for inspection, but was not done in front of me with my supervision. The only thing I could think of being the reason for the inspection, was my bottle of water. Without ever telling me or me seeing it, they had also removed my work laptop and placed in a separate bin. They ran my stuff through security one more time (they let me drink the rest of the water in my bottle), one bin with my bag and now empty water bottle. I grabbed my bag/bottle and left. When I got to my destination and wanted to get some work done on my computer, I noticed that my laptop was missing from my bag and understood after some time what had happened. How can you remove personal items out of someones bag without telling them? After multiple calls over 2 days, I got to speak with the Lost & Found office at Oslo Airport (for one of my calls I waited 1 h and 58 min before I hung up). They confirmed they had my laptop, and that I could pick it up for a 101 NOK fee. Staff at Lost & Found was not willing to hear me out/receive constructive feedback and were not at all apologetic. Also worth noting, that when you lose something at Oslo Airport, you register your lost items at this site called MissingX. I saw 6(!) other laptops registered that morning before noon (my flight was at 7:30 AM)! Something is really off with the way they operate at security at Oslo Airport. Be aware and always pay very close attention to your stuff (have them open it in front of you)! "bizarre example of total inefficiency"
Not Verified | Having arrived 2 weeks earlier and been blown away by the speed and efficiency that saw us in our taxi with our checked luggage (for four) exactly 15 minutes after the plane touched down, it was a much less satisfactory experience on our departure. On the plus side it is an attractively designed and clean airport. The toilets are probably the best we've come across in an airport. The wifi is free for browsing but dropped out constantly and charges for streaming, which is a pain if you have a long wait. We did not like the fast track security for business class passengers. Instead of having separate security, it is set up so you have to push in front of all the non-premium fare passengers. The staff are not helpful in this regard and we found an employee passing all the security trays past us to the rest of the queue so we could not proceed and were left like lemons in our aisle, until he was called away and we could take trays for ourselves. British Airways use shared lounge facilities at Oslo and the OSL lounge is not a good experience. We did find space and it was comfortable but it was too small to cope in busy times, too dark (as all the blinds were closed in the middle of the day) and very under staffed. No one was at the reception desk so anyone could walk in. The choice of food was really poor - just soup or a tiny salad bar with nothing appetising in sight. No one cleared away. It was generally the least welcoming business class lounge I've seen in 20 years. There was no information about distance to our gate and no announcements were made (though that is common these days). 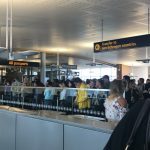 As there were no staff to ask we set off with 30 minutes before our flight departure, only to discover a mile long passport control queue between the lounge and the departure gate! The lounges are never located in between security and passport control, except where (for European flights) passport checks are only done by the airline at the boarding gate. Could not see any way we would make our flight and there were many people getting very stressed about the situation. No one at BA check in or in the lounge told us to expect this. Some "helpers" told us we couldn't use the shorter "all passports" queue with an EU passport (which is wrong and not what "all" means). They said the planes would wait until everyone got through or the airlines would send staff to collect us/authorise queue jumping? Everyone was forced to go through the self service control (far too few machines to handle the number) unless they had children under 18 who aren't permitted to use the machines. There were only a few children so there was no queue for the human passport control whilst the rest was just chaotic. I can't think of another country that makes it so difficult to leave. And Norway is in the Schengan area for goodness sake, so who knows what people travelling to, for example, France using an ID card were supposed to do. It was a bizarre example of total inefficiency in an otherwise pretty efficient country. That said, our plane did wait until everyone got through but it must play havoc with air traffic control and plane scheduling. Sort these things out and it could be a great airport experience! Not Verified | Spacious, light, beautiful design. Norway uses automated services a lot more than other countries and the self-check-in of ourselves and our baggage was a bit confusing with unclear instructions. Our departure lounge didn't have enough space for everyone to sit.